The little town of Foresthill marks the southeastern edge of the area CJ and I call the Golden Hills. It could easily be called the Green Hills, because by the time you get up there, much of the foliage is evergreen. Here in the Foothills, the line of demarcation between deciduous trees (mostly oaks) and evergreens is also the snow line. Will you get snow in Foresthill? Yep, not too much, because it’s right on the line, but you will get some of the pretty white stuff. (Pretty, that is, for about a day, in my opinion). If you really want a lot of snow, you need to get up above Colfax (why?). Foresthill, at about 3200 feet of elevation, is located on a broad ridge between the north and middle forks of the American River. Without exaggeration, some outstanding white water river rafting and the best running trails in America can be found in or near Foresthill. The Western States 100 Mile Endurance Run passes right through the town. To get to Foresthill, you can take Highway 49 South out of Auburn heading toward Cool (Cool? Yep. I am not making this up. Cool, California. 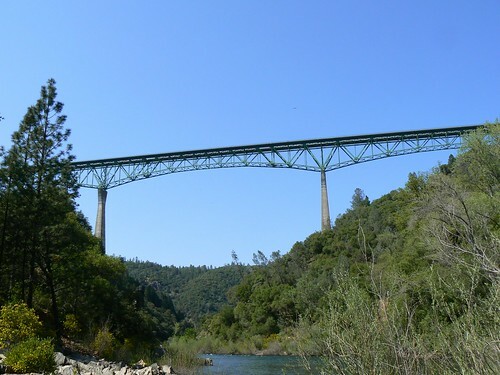 ), but don’t cross the bridge down at the Confluence, just keep going straight and twist your way back up out of the American River Canyon on the “Old” Foresthill Road until you hit the “New” Foresthill Road, turn right and keep going till you get there. No. Forget that. The best way is to take the Foresthill Road exit off Interstate 80 and cross the Foresthill Bridge, the highest bridge in California (!). After you cross it and start breathing again, park your car and take in the sight of the north fork of the American River far, far, far below. Then drive about 20 minutes till you get to . . . you guessed it . . . Foresthill. It takes a while to get to the big shopping centers in Auburn or Roseville-Down-in-the Flats. That’s why the homes are so reasonably priced. There is a direct relationship between distance to town and home prices here in the Hills. Ahhhh. Capiche?